The figurative term Browser Wars refers to the competition for market share in the web browser marketplace. It is often used to refer to two specific challenges – the first during the late 1990’s where Microsoft’s Internet Explorer replaced Netscape’s Navigator as the dominant web browser; and the second which started in 2003 (and still continues) where this newly gained market share is under attack and conceding position to other emerging browsers. 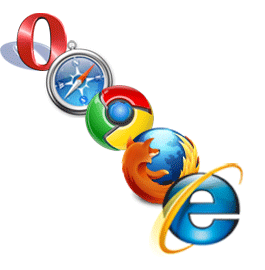 The result of the Browser Wars is that the most popular web browsers in use on the Internet changes over time. Therefore any Small Business Website Design must not only look good and provide the necessary functionality for the business organisation in its own browser of choice, but also in many different browsers. How does Browser Choice impact my Small Business Website Design? A Web Browser is a piece of software or computer program that retrieves, displays, and sends information on the World Wide Web or Internet. This program receives information and then decodes it into its constituent parts. These parts are then displayed as text, images, videos, or audio on the user’s computer screen. The user can also interact with the web browser to make choices or to request other information, and this is then sent back to the Internet by the browser. The impact to us as Nottingham Web Designers is in the display of the retrieved information. Even though every browser receives the same information, they may process, treat and finally present that information in differing styles. We pride ourselves at Web Design Nottingham Net Quality that all our small business website designs will look and feel fantastic in all major browsers. There is a little more effort required in this, however we are great at what we do, and we enjoy the challenge. Which browsers are we talking about? When Tim BernersLee invented the Internet in the late 1980’s and early 1990’s, he also wrote the first web browser WorldWideWeb. By the end of 1992 other browsers had entered the market offering real choice and competition, before Netscape emerged in 1995 as the clear market leader with over 80% market share through their browser Navigator. Microsoft’s Internet Explorer enjoyed under 5% market share. By 1999 therefore, Internet Explorer had gained the majority of the market, and continued to increasingly dominate the market share. This led to the demise of the rapid innovation and the decline in the development of web browsers until 2006 there was only one new release of Internet Explorer since the emergence of version 6 in 2001. Following its defeat, Netscape opensourced the code of their Netscape navigator and this was developed into Firefox. This was released in 2004, enjoyed steady gains within the market, and reached a peak market share in 2010. Similarly Opera, originally a commercial concern, was offered as freeware in 2005. This contributed to increasing gains in the browser arena, and although it remains a small player, it is considered as one of the more reliable web browsers. Microsoft finally released a new version of Internet Explorer, including features which Firefox and Opera had been offering for years. And Apple entered the PC fray with a version of their Mac only web browser Safari released for Windows in mid 2007. Google entered the browser war in 2008 with their offering called Chrome. This was also opensource and offered freely to match all the other main contenders. According to most sources, Chrome gained almost 4% of the market within the first year – a tremendous result for a late entrant to the combat. Where are we today in terms of Web Browsers? The figures are from Wikipedia for March 2012, and are obtained by averaging the top five Internet usage measuring organisations. How does this affect my Small Business Web Design? It is essential that your Small Business Website must perform perfectly in at least the five top web browsers. This can be achieved by a website design that follows the standards and recommendations and which is tested for presentation and performance in all these web browsers. If you web design has not been verified, it should be – ask your web designer if they have thought of examining your business website in all the available web browsers. One of the great things about living in a free state is that we have choice. Companies in a free economy know we have this choice, and so are motivated to develop and improve on their offerings to retain customer loyalty. It is no surprise that Microsoft has released more versions of the Internet Explorer since the emergence of the many freeware browsers than at any other time in its lifetime. This is great for the consumers as they have access to more advanced functionality and they are not tied in to one product. It is also great for us here at Web Design Nottingham Net Quality as we can proudly show that we stand heads and shoulders above many of our competitors as all our business website designs work in all the major browsers...plus I personally find it more challenging and therefore more interesting! Do not hesitate to look over any of Business Website Designs or to contact us to find out how we can help you obtain your ideal Business Website for all browsers.